Spring 2008, Cedar Point. After years of playing imitations, I met the real thing. Photo by Eric Stevens. 2017 has been a dark year, but today, on a cloudy spring day in Rochester, NY, there is a spot of brightness. Donkey Kong has finally been recognized, joining classics from Nintendo and other video game publishers in the World Video Game Hall of Fame at The Strong National Museum of Play. Shigeru Miyamoto, Donkey Kong’s designer and, over thirty years later, a living legend in the industry, had intended Jumpman to star in many of his games. While his name and occupation changed, Jumpman lives on as a plumber named Mario (Super Mario Bros., Mario’s breakout role from 1985, was inducted in 2015). Donkey Kong spawned two sequels, Donkey Kong Junior (which feature Mario as the villain) and Donkey Kong 3, as well as the educational Donkey Kong Junior Math, before taking a leave from the spotlight as Nintendo moved into the home console market. 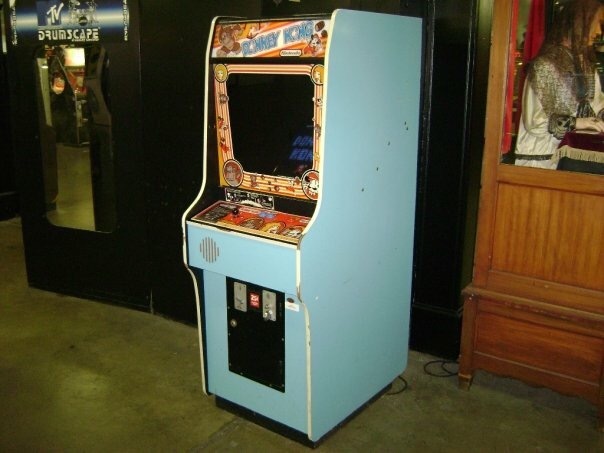 Donkey Kong and the titular arcade game returned to Nintendo’s Game Boy in 1994, followed by the Donkey Kong Country and Donkey Kong Land series developed for Nintendo by Rare. In the two decades since, Donkey Kong has appeared in many more titles as the hero, a sports icon, and a musician. The Kong family has grown to include dozens of primates of all species. The 2017 class of the World Video Game Hall of Fame also includes Pokémon Red and Green for Game Boy (the original versions released in Japan in 1996), 1991’s Street Fighter II arcade game, and Halo, released on Xbox in 2001. The World Video Game Hall of Fame was established in 2015 and is part of the International Center for the History of Electronic Games at The Strong in Rochester, NY.